The travelling continues and takes me to Firenze (Florence). With an 8 Euro train trip, Michelle my new travel buddy, Alan & Cynthia catch the train together from Arezzo to Firenze. The journey was filled with reflection of our incredible experiences. Mostly, how the group mixed easily with all blends of cultures coming from all parts of the world. Mine being the craziest for the longest travel required for the shortest period stayed. It' was evident we wanted to maintain the energy that filled us over the past days and relive as much as possible. Constantly, remembering the recipes and who did what and how - making mental notes. Just brilliant. We say our good bye to Alan & Cynthia as they are off to another part of the city whereas Mitchell and I set off to find our hotels right in the centre. Bookings.com I love you. So easy, so convenient as I found a hotel at the last minute located right next to Il Duomo!!! I mean I opened my window and it's right there. If I had longer arms I could reach it. You bewdy! 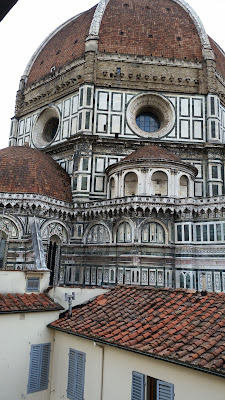 For those foreigners (not the travelling kind) , il Duomo is the biggest thing to see in Firenze. Perhaps that look of confusion has you stumped, let's try the statue of David, or maybe the Ponte Vecchio. Geesh.... You must come here then you will see what I mean. Anyway, we settle into our hotels and then lunch is next. Belly is full so we set off and check out the crowds gathered at Il Duomo. It's hot , it's busy, it's touristy , its selfie stick sales in your face , it's everything you can imagine. We love it and just take it all in. Leather leather leather everywhere too. Of course, we stumble across a leather market so of course we buy our first handbag. Girls unbelievable!!!! Insert huge smiley face or maybe 2 thumbs up coz we are high on leather.